The jar on the left was properly washed, leaving the trub behind. 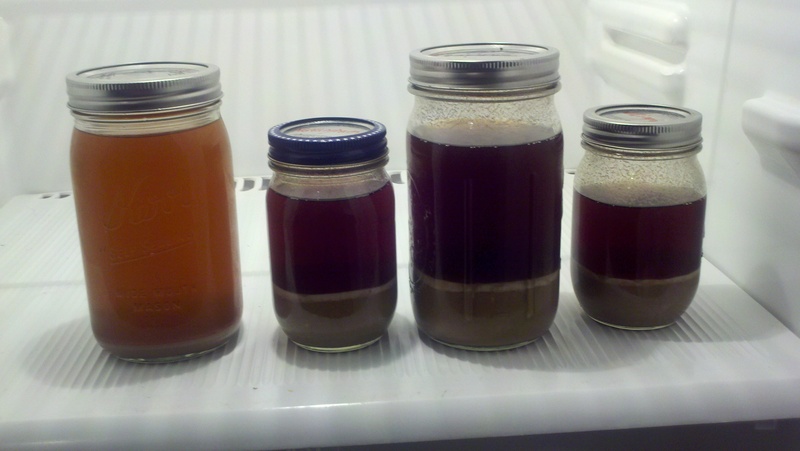 The three on the right have a layer of trub below the layer of clean yeast. If you’ve been homebrewing for a while, or even if you’re just starting, you’ve probably heard reusing your yeast can be a good thing. In most cases, the yeast is not in ideal condition when you buy it at the homebrew shop. Depending on where you are, your yeast packet or vial may have been shipped from the opposite coast, half-way across the country or from another continent. It take three or four uses for the yeast to really hit its stride. I’m still learning the best techniques for yeast washing, but on a recent bottling day, I learned an important lesson: when you’re tired, you’ll probably mess something up. As you can see from the photo, I was not careful to leave all the trub in the settling vessel. It was late, I was tired and I just wanted to go to bed. I poured the slurry and let it settle, then poured it into the final jars. I made sure to leave an inch or two of sludge in the middle step, but there was so much trub in the jar I will have to wash the yeast again before I can use it. As you can see, the next day, I properly washed the yeast from the biere de garde I brewed and the jar contains only nice, clean yeast. Anyone else miss an important step in your process? Ever have something like this happen, which you know you should have caught but missed it and were completely shocked the next day? Tell me your story. Keep trying to make super beer! That’s what the hobby is about.